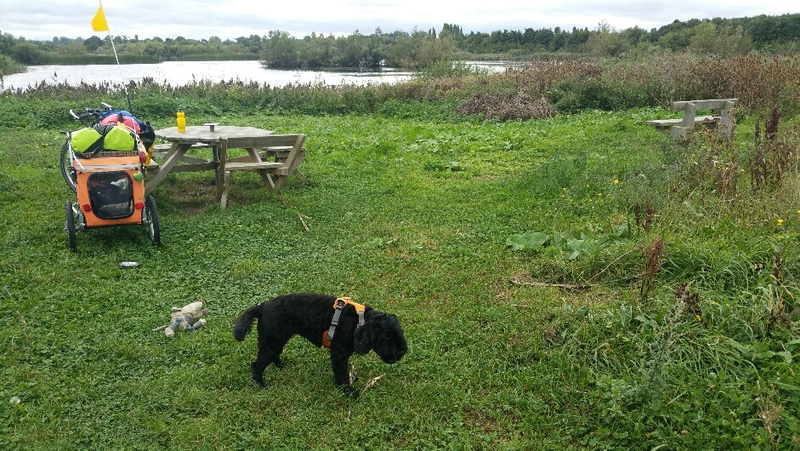 The A428 goes straight from St Neots to Cambridge in about 23 miles, but we took the scenic route to the north, via Godmanchester and St Ives. Sustrans Route 51 does an even bigger loop, to take in Grafham Water, but as it was raining when we set off I decided to save that for another day. The scenery was flat and muted under a grey, cloudy sky. There was more sky than anything here – low and vast. St Ives was bustling and seemed to appear suddenly, like an oasis in that dreary landscape. At Market Hill we saw Oliver Cromwell, for the second time in a few days; this time in bronze. He was man of St Ives, said the statue’s inscription. 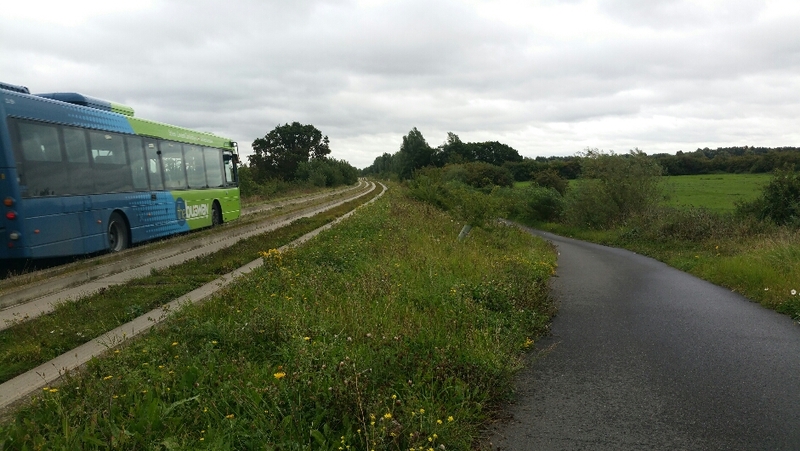 We had joined Route 51 by this point, which took us 9 miles towards Cambridge from St Ives on the ‘busway’. This peculiar thing is two parallel concrete channels in which buses run, guided by small wheels sticking out at the front. A smooth, wide cycle path goes alongside, the whole thing traffic free apart from buses hurtling along piloted by drivers texting their mates. The channels and the infrastructure look new and in good condition despite the wildflowers that grow on the embankments and on the tracks themselves, almost as if deliberately planted. It looks attractive, especially passing as it does the great expanse of flooded gravel pits that now form Fen Drayton nature reserve. We stopped at the reserve so I could eat lunch, and Raisin could play with Mouse. Raisin had insisted on running the first few miles of the busway but I was tired and keen to get on, so she and Mouse travelled in the trailer after that. But the wind had swung round and the beautiful lakes replaced by boring fields and building sites and my bum ached and it was hard work. I caught myself thinking a couple of hills might be nice, to give some variety to the pain and the view. 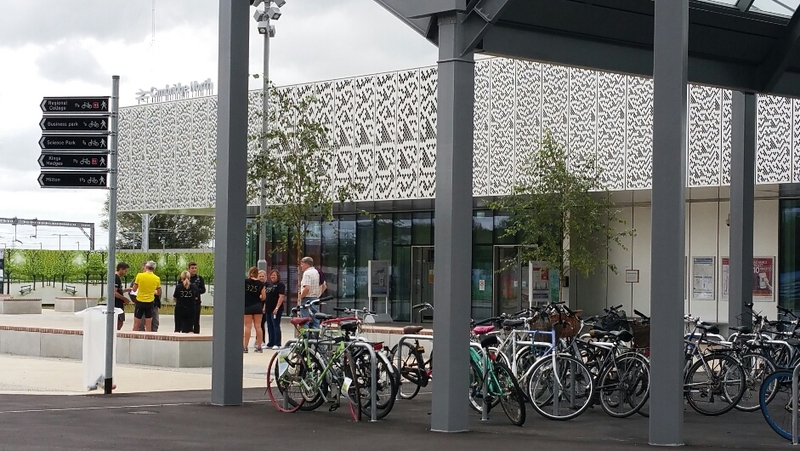 In Cambridge the busway ended near the Regional College but the Route 51 continued as a cycle path, past Cambridge North station looking modern and ready for hundreds of cyclists, judging by all the bike storage. 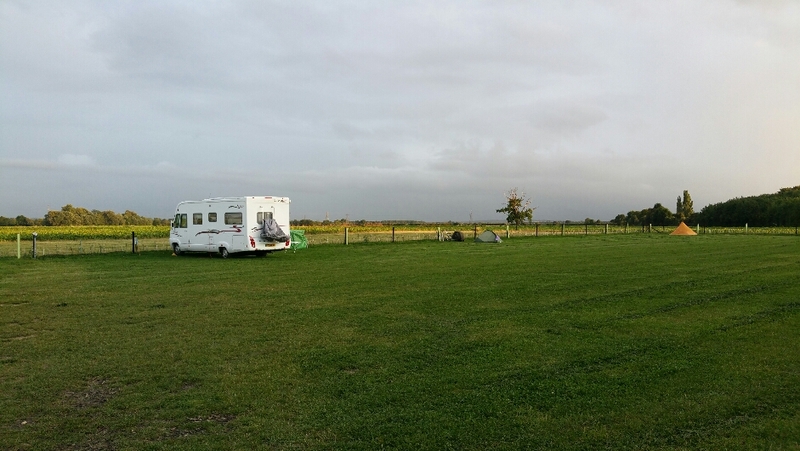 We might have continued into town for the Camping and Caravanning Club site, but after another bad experience last night, I had booked a quiet site in Horningsea, just outside the city, and we left 51 to head north along the Cam towpath. Last night I had filed my report and closed my eyes for much needed sleep when it became clear that the man in the tent next to ours was not going to stop talking on his phone until he had called everyone he knew to tell them all about his unremarkable day, and anything else that occurred to him. I wondered if he paid some of these people to take his calls, since he did nearly all the talking and it was hard to see what benefit there would otherwise be in receiving them. He wasn’t talking particularly loudly but every word was audible and after a couple of hours of trying to distract myself with podcasts, audio books, mindfulness etc, I just wanted to kill him. So by the time we reached the Cam I was looking forward to finishing the ride. We had done 30 miles, much of it at Raisin’s trotting pace of 5 or 6 miles an hour. 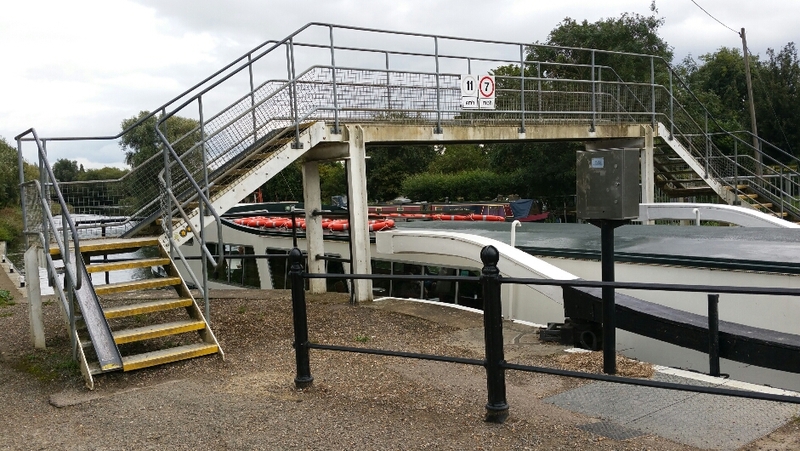 Unfortunately our river crossing point was a bridge with steps up one side and down the other – impossible with loaded trailer and bike on my own. 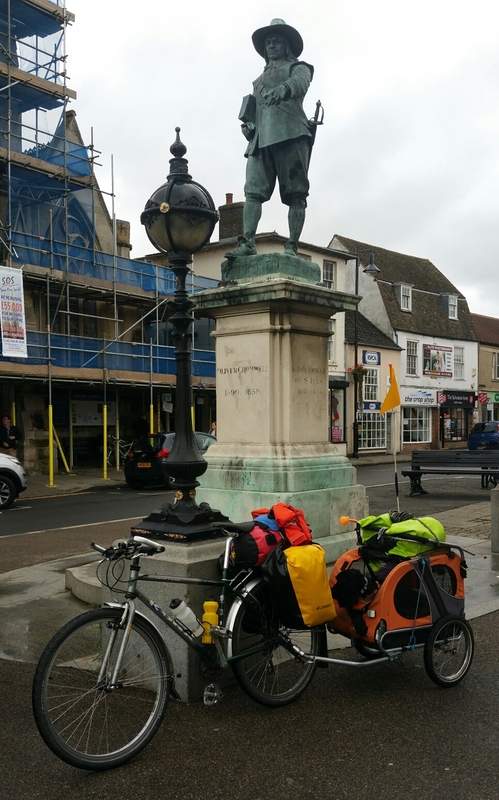 We had to carry on to a road crossing at Waterbeach, adding another 3 miles to the ride. There was consolation though, as a kingfisher darted from an unseen perch over my head, its orange underside clearly visible and a change from the usual blue dart we see. Then a fish – a small dolphin I thought – leapt from the water in a graceful arc. Then a roe deer appeared on the opposite bank, prancing, before bounding off. All as if to say we are glad you came this way. The camp site is small a quiet. There is a lovely big spotless shower, with full lighting and no mildew. I used it; plenty of room for Raisin in the cubicle and no one about to object to her presence there. It was lovely and much needed, although I was disappointed some of the tan came off my legs, especially round the ankles. 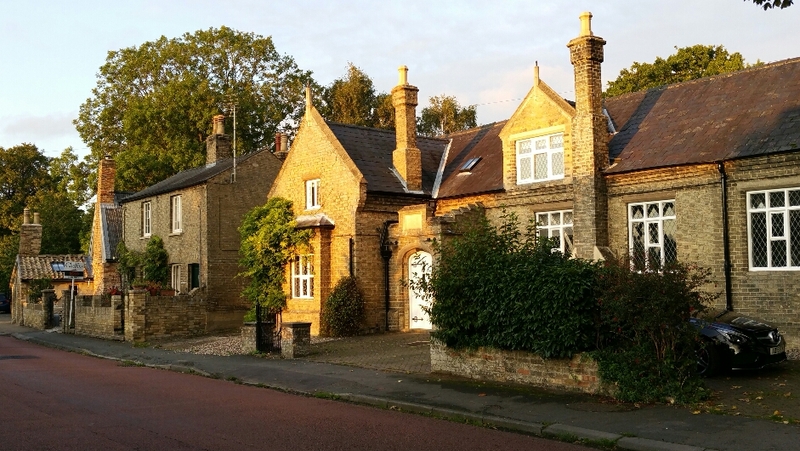 Raisin and I went to a pub in the village, whose houses looked pretty in the evening sun. Again there were no county boundary signs today but we must be in Cambridgeshire, and those bricks must be Cambridgeshire whites. 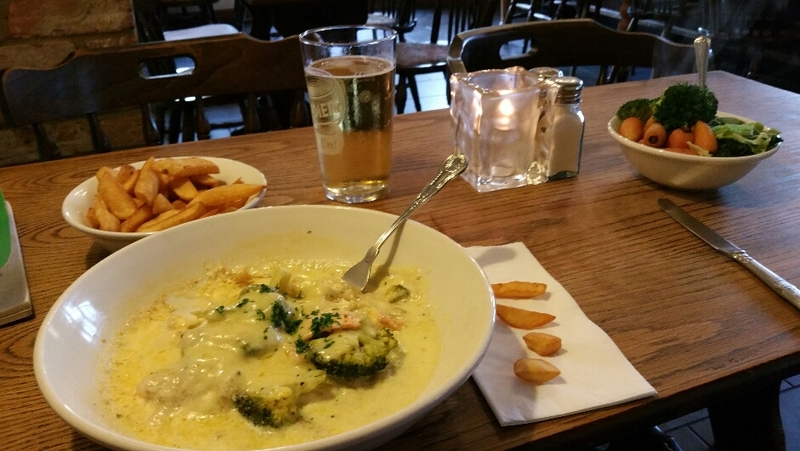 I had veg lasagne for dinner, with chips and broccoli. Heaven. Tomorrow is the last day; Bury just 34 miles away. A friend is coming to find us and take Raisin and the trailer home by car so I can ride the last bit solo.